“One speed syndrome”, referring to the feeling of, and ability to, perform at one speed when training and racing. When assessing an athlete’s performance or asking them about their thoughts on their limiting factor, how often have we (and probably you) heard “I’ve only got one speed”? Followed up with “I work so hard and seem to progress so little”. 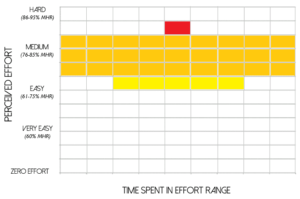 One speed syndrome happens due to spending too much time in the “grey zone” or “middle ground”. Always working too hard to be truly aerobic, but never easy enough to recover. Meaning the body is allows too tired for harder / faster efforts. Everyone wants to be successful, in whatever form that takes. Athletic performance, like all things, needs patience and time with consistent and appropriate training if long-term goal are to be reached. Learn how to go easy to go hard. In other words, learn how to train at low intensity to achieve your higher potential. The often-perceived problem is that low intensity means, for most athletes, going slower! In the beginning this if often true and frustrating. Going slow can’t make you fast, can it? Many athletes have conditioned themselves into thinking that their middle ground training is easy and begin to feel comfortable, and this makes “real” easy feel “too” easy! Its easy not to go easy – you see someone in front and they become a target and going easy is forgotten! This results in the often heard “I’ve only got one speed” and even though they train “harder”, pace and race results fail to reflect the effort. Why? Because going easy is the key to building a bigger base / engine AND recovering. Most athletes work on the basis that by going harder, they must be able to race harder. However, this always results in a plateau in performance, injury and/or illness. Going slow – you get faster doing it! 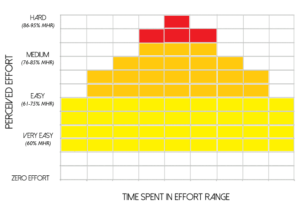 Counterintuitive as it sounds, “Learn how to go easy to go hard” is true, and here’s why. Base building: this first reason is universally known, but few do it correctly; it builds a big base. Low intensity, or training aerobically, MUST be the endurance athlete’s primary focus when training. Triathlons are AEROBIC sports! Movement pattern development: training at low intensity allows the athlete to be aware of, and develop, the correct movement patterns. Further developing overall cardio and movement efficiency. Low intensity is healthy! Injury rates are very much reduced and therefore allow for consistent training, day-after-day. This, again, is universally known and is much more achievable when training at the right intensity. Fat burning. Like in the weight loss world, working harder is thought to burn more calories and result in more weight loss. However, low intensity training allows your body to burn fat. 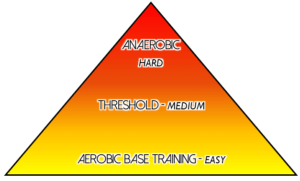 Simply, aerobic training oxidises body fat to create energy for the muscles to function. High intensity training uses stored glycogen (glucose) to create energy. You may sweat more, your muscles might burn more and you’ll feel the effects longer into the day, but you really haven’t been efficient at training or fat loss! It makes training FUN! Finally, with a little patience and acceptance, low intensity training does make training enjoyable. Coming back from a long run won’t ruin your day, or your family commitments! You won’t need to spend hours half asleep, feel grumpy, stumble around on jelly legs or eat everything in sight! The fact is that Mario (and his fellow top athletes) has developed a very efficient aerobic system and will be racing at the top end of his aerobic pace! He (they) are so fast and efficient, but still aerobic (other than the final real sprint if required). Ever noticed how composed they are at the finish and that they can chat and cheer their peers in? This wouldn’t be possible if they were working above aerobic levels! 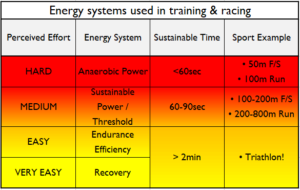 So how do you go about training at low intensity AND making sure it is low enough? Very simply, and without the use of any technology, try cycling and running by ONLY breathing through your nose! Achieve this and you are almost certainly training aerobically. However, if you just can’t get enough air in through your nose, your working too hard – anaerobically. By doing this, you will become sensitised to how it feels to be training at the right level. It is a tried, tested and successful way of regulating your training effort through self-perception of effort – which is by far a better way to train! Heart rate training levels will provide a good guidance / reference to your nose breathing. The goal is to calibrate your nose only breathing with your aerobic training level. Work any harder, into the middle ground (threshold), and you will find your nose is inadequate at drawing in enough oxygen! Where do you get heart rate training levels? 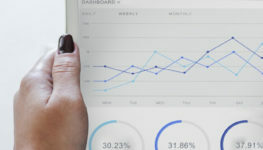 Built-in algorithms are part of all modern gadgets, they estimate training levels based on the information you enter when setting the gadget up. For more accurate levels, perform a test to accurately determine your personalised levels. If you are patient, low intensity training will begin to speed up. Your movements become less strenuous, your body become more efficient, your pace increases, hills, headwinds, etc can be controlled better, and you will be healthier. Not only will your easy efforts become faster, your harder efforts will become faster. The body will recover faster between reps and between sessions, meaning your hard efforts reach their true potential. As your training efforts become more efficient and faster, your race pace will also be faster! One speed syndrome is a self-inflicted ailment! Intentional or accidental, it is caused by training too zealously or with the assumption that training harder all the time is the way to get faster. Once recalibrated, you will soon start to see that going slow does make you fast. You will be healthier and find everything more sustainable – life, work, training, etc. Be patient and let it happen. You will get stronger and be more motivated. Wait until you experience a hard session at higher paces, powers and comfort than you ever previously could! Slow down now – you will get faster!